The second installment of a somewhat long story about the recent additions to our growing family of manufacturing equipment. If you read last week's post about our new pick-and-place machine, you likely, at some point, said to yourself, “SparkFun’s new pick-and-place machine sure doesn’t look or sound like a bootstrapped solution.” And that would be a fair assessment. But where we ventured into a more stable and proven (read “somewhat expensive”) equipment investment for populating our PCBs, we simultaneously added a very different and new type of equipment to our lineup that very much met our bootstrapped criteria. While we were exploring new pick-and-place machines, we also began to realize that a new machine would quickly outpace our ability to hand-stencil PCBs which, until this fall, had been our exclusive method for adding solder paste to the approximately 2 million circuit boards that we have personally built here in Boulder. Unless we found a way to increase our stenciling speed and capacity, the speed of our new pick-and-place machine is so great that it would result in that machine sitting idle for long stretches of time while our hand stenciling process played catch up. Not to toot our own horn, but our board assemblers have developed into quite impressive machine-like PCB stencilers over the years (read "toot toot!"). But even as awesome as we are, we simply cannot keep up with the rated 16,000CPH speed of our new MYDATA pick-and-place machine. Our new pick-and-place machine is capable of populating, in a single operational cycle, 6 times more square inches of PCB real estate than our older machines (306 sq. inches vs. 50 sq. inches, approximately). 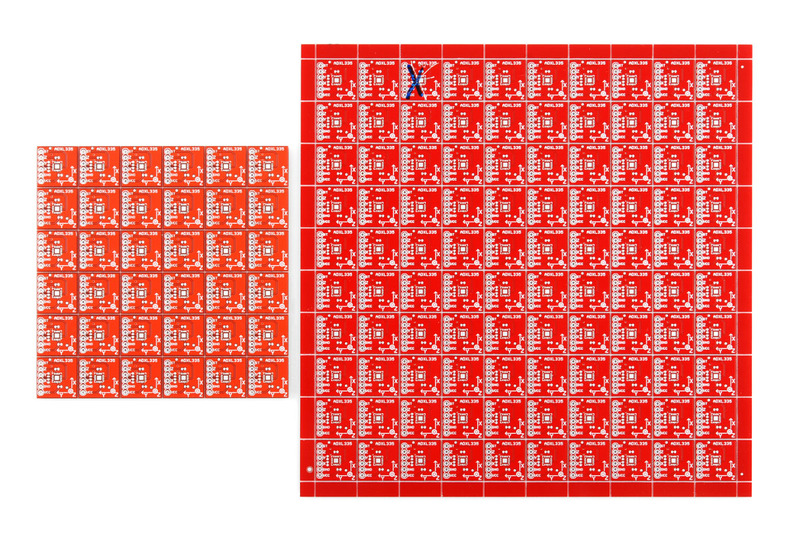 However, we knew that the largest PCB panels we could consistently stencil by hand maxed out at around 6 x 6 inches. So we decided that the time had come for us to explore the world of automated and semi-automated stencil printers. A stencil printer is a fairly simple machine that applies solder paste to circuit boards, just like we have done by hand here for many years. However, upgrading to machine stenciling takes advantage of the increased pressure and improved pressure consistency that can be applied to a stencil and PCB panel via a pneumatic pressure system. For reference, we took a really rough measurement and found out that we typically deliver 6-8 pounds of downward pressure when stenciling by hand. And our new stencil printer delivered a consistent 32 pounds of downward pressure when activated. So, with the right setup and controls, a stencil printer can evenly disperse that pressure across a longer blade, holding that same pressure consistently throughout the entire paste stenciling swipe. Because of this, stencil printers can then be designed to accommodate larger PCBs or PCB panels for increased production efficiencies. At the first of this year we were introduced to the DEK Horizon iX stencil printers and were blown away by the level of detail in their design. Needless to say, we wanted one as soon as we saw them in action. And we went so far as to have some large panel PCBs built up for us that we took out to San Jose so that we could see them stenciled in person at one of DEK’s engineering facilities. These in-person tests impressed us and we learned a great deal about how stencil printers work while watching the DEK experts set up and stencil our boards on a Horizon iX. However, while I was out on the west coast to visit DEK, I also drove up to Sacramento to take a tour of Parallax. While visiting with them, they told me about some entry-level stencil printers that they had seen being used on a recent visit to Shenzhen and felt that they were sufficient for the level of PCB designs being built by the likes of SparkFun, Parallax, Adafruit, etc. So I returned to Boulder with a stencil printing alternative to research. After a good bit of digging, we found a manufacturer in Shenzhen that was able to answer some of our questions. The rep that we communicated with did a fine job of sharing with us all of the info she had but the documentation that we were sent certainly left a lot to be desired. However, it was clear early on that, buying a lesser sophisticated stencil printer from Shenzhen was going to be worth the risk, primarily for the initial cost savings over machines being sold by other manufacturers with sales offices here in The States. This one would come with far fewer of the high-end features that are mostly standard on the DEK machines and others like them, but we believed that we could live without those luxuries for now. And knowing that we would be learning a great deal about stencil printing by simply introducing a stencil printer, any stencil printer, into our process, we ultimately opted for the less expensive yet more unpredictable printer. This might not come as a surprise to some of you, but our stencil printer did not function as it was supposed to upon arrival. For starters, it was not packed well inside its shipping crate and arrived on our docks with a damaged motor after not being transported upright during shipping. However, the company quickly sent us a new motor which we replaced, with the help of Paul, our onsite mech-e expert. But then, after powering it up for the first time, we discovered that some of the wiring had been done in reverse so we pulled out our multimeters, did some troubleshooting, and then rewired it correctly. Oh, and did I mention that we received no schematics for the stencil printer? So there was a lot of trial & error going on! But once we saw that both the mechanical and electronic systems of the machine were functioning as they were designed to, we turned our focus onto ordering larger PCB panels and the stencils (also known as foils) to go with them. Since that time, we have gradually begun transitioning our highest volume PCB designs over to this new stenciling process. And to date, it has been a great upgrade for us. We did learn, however, that our new stencil printer didn't provide a very efficient means of lining up the foil to the paste-free PCB panel. As noted earlier, higher end stencil printers come equipped with many features that our new machine did not. One of those features is a vision-alignment system that, once programmed, ensures near perfect stencil-to-PCB panel alignment every time a fresh new PCB panel is loaded into the machine. 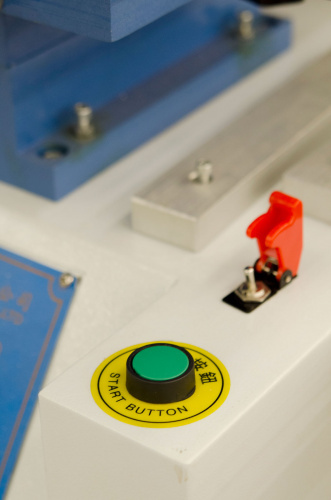 Our printer utilizes a series of knobs to manually adjust the stencil in the X, Y, and Theta directions. But these adjustments can really only be made when the stencil is already laying directly on top of the PCB. 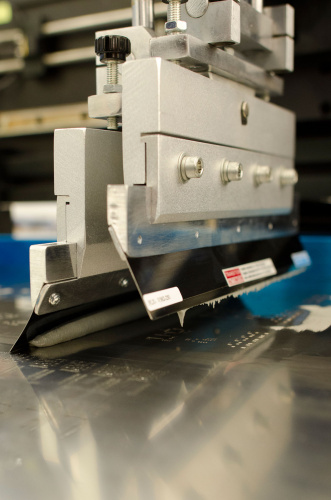 Unfortunately, the fastest way to join the stencil and PCB together, after you had the machine set up, was to initiate the print sequence which provided only about 1 full second between the time that the foil and the PCB connected and the blade of the printer began its swipe. As you might've guessed, that is barely even enough time to even find out where the alignment is off, much less to be able to make the necessary adjustments. So we decided to hack on our stencil printer and install an interrupt switch that, effectively, released the pressure of the head unit and dropped the foil onto the bare PCB without actually initiating the print sequence. This allowed us to take all the time that we needed to make the necessary alignment adjustments before printing. The switch would then be released to return the head unit to its default position. And then, once we were assured of a solid alignment, we could begin the full print through the machine's touch-screen interface. Because it's the Answer to the Ultimate Question of Life, the Universe, and Solder Squeegeeing. Oh, It does. Just Don't Panic when it's wired backwards. Unfortunately, due to the Probability Drive (Two to the power of one-hundred-thousand to 1 against and falling), the HG2G'S construct has been replaced by a set of senior network analysts, and Ford is now a penguin. Ah, this must be some obscure definition of "Safe" that I haven't heard yet. My colleague is rapidly loosing limbs, and a large Sperm Whale has just materialized over a planet. Then, after a sudden wet thud, was silence. For a while, nothing happened. Then, for a short time afterward, nothing continued to happen. I am trumped once again in Hitchhikers Guide to the Galaxy randomness. Probability- three to the power of 2 for and rising. "What is this odd sensation I am feeling? It feels very strange, as if some unforeseen force is dragging me somewhere. It makes such a wonderful, whooshing sensation. I will call it falling! But what is this that makes the wonderful whooshing noise, and creates such a tingling feeling all across me. What shall I call it... hmm.. Air! Yes, that is what I must call it. Air, such a wonderful name for such a wonderful thing. That is strange, that rather large brownish-green thing seems to be getting larger. In fact, it seems to be the force of the wonderful magnetism that is making me fall! It needs a name, such a beautifully colored thing must have a name. Ground! That is it! Gr-ou-nd. Such a wonderful ring to it, it seems to roll off the tongue rather well.. Now that I have named that, I must find out why I am here.. I think it must hav-"
at which point the whale collides with the ground, and a rather wet thud reverberates throughout the area. After the dust settles, there is not much left of the whale but a few pieces of blubber and a rather large crater. How are you doing, Marvin? Quite badly, I expect. Thank you for making a simple door very happy. Let's say, for the sake of what I am going to call 'argument', I will call this thing back here a tail. Hey, I can really thrash it around! I may find out what it is used for later. Now, have I built up any coherent picture of things yet? Thusly having my references exhausted, I must exit the competition. We require a third party to judge who out-Douglas-Adam'ed the other. Yes. That would be in order. Though I admit to referencing to the book in my third comment. But we haven't even started! The Question to the Answer of Life, the Universe, and Everything! The life cycle of a mattress! Planet wide rock concerts, with ships being driven into the sun! What about the life of training and self-sacrifice needed to be a sandwich maker! I must come forward and state that I have never before seen The Matrix. I sense I am missing out on such a wondrous film though... what say you? YES. Definitely. Watch it NOW. Sorry Admin. We should take this to a different forum, not a respectable business' comment thread. But: What was it about mattresses? Something about them all being called Zem? Moved to #1 in my families netflix list. Yes, all the mattresses are named Zem, however, this could be the result of a Pan-Galactic Gargle Blaster (or two). Also: Watch The Matrix Revolution and The Matrix Reloaded. OHMYGOSH HOW DID I LIVE MY LIFE WITHOUT WATCHING THESE MOVIES? Told ya. Personally, the Matrix Trilogies are the standard against which every film is compared. When you've done six impossible things before breakfast, why not round it out with a meal at Millways, the restaurant at the end of the universe? Wow... good movie, took a couple of times watching the first hour for it to make complete sense (that first scene at least). I know you guys are doing the cost analysis of going with DEK verses a, by far, inferior PCB machine. Why not take the price hit and not have to deal with hacking the machine to do what you want? Plus, within bargaining, you could have DEK do proper training (and certify people on their equipment) and probably get some servicing requests lined up for when it breaks down (if it does). To me, in production situations, it's better to be overly cautious and go with something that is going to work, not something that was shipped wrong, has no schematic, wired wrong, and you had to hack to do something you want. I don't know, maybe I'm thinking about this the wrong way, but I would've gone with the DEK for these reasons: Support in the States, Programmable to PCB, can handle a lot of PCBs when the demand is needed, trainability (one thing everyone should strive for is to be on machines that EVERYONE uses). Plus, DEK, like most companies, should put the extra effort in when the machine breaks. For the name suggestion: Mr. Pasty. You make some very good points. However, the printer we bought was purchased at a fraction of the price of a DEK machine. It would take a great deal more problems and downtime to negate the cost savings and value that we're getting from this specific setup. But then you're back to square one when SF decides that your current solution is too slow and youâre faced with going to an Ink Jet printer style of solder pasting your boards. My bet is you would end up using less solder paste with an Ink Jet printer then the stencil printer. I canât wait for you guys to come up with your own form of Ink Jet printer with a .01 mil head on an X-Y plotter to paint your own boards. It seems you guys have the talent to figure out how to make one. If I was SF, I would make sure SLT CO Ltd gave you schematics for their unit. Also I hope you guys didn't null and void the warranty with your hack. Most big companies don't like you hacking their machines. An ink jet style one verses a stencil... I'd rather get a stencil one. Granted you use more solder, but the ink jet style you have program with the gerber files. This means training, plus it will mean more costly issues in the future. All the information is already there in the Gerber files. And the program just has to read the file. A lot like what your computer already does on with your printer. You have to train people on how to use the machine to make sure things are right. (This also takes money). Low RoI with SFE's current level of work. The thing about PCB boards that feed into the PNP is, you want to the output of the PCB to match that of the PNP's input. You don't want any point in the line where you have to wait. By waiting, you can cause higher failutes. See where the assembly line efficiency comes in? I'm not saying the ink jet style is bad, I'm saying that it's overkill for SFE at the moment. If you think about it, an inkjet can do an A4 sheet in about 6-8 seconds (Ballparking here...) so it would be slower than a good stenciler - plus you'd have to deal with clogs, tank refills, cleaning, blah blah blah. And if it was built in house, then maintenance would be cheap-ish (depending on how bad it broke and the fact that you don't have to pay markup) but hard to train new employees in. BUT - it might be something for someone in the community to have a shot at! Could work out great! I totally understand. Buying something like this is no easy task and finding the best deal for a machine that does what you want is like looking for the Ark. As I am not a manufacturing engineer, I do not know what variables to take into consideration, so my suggestions might be fart in the wind. But it is good to see you guys trying to streamline things. Hindsight is 20/20. The addition labor hours for hacking and downtime probably added a considerable amount to the cost of the LEADSMT machine. Cupcake. Since the paste is like icing and the stencils are like the little cakes... mmm... I might just have to go eat one or more now..
BBBSST (Big Blue Beige Stencil Squisher Thing) or just Mr. Squishy Pants. Love these posts on manufacturing! What about the stencils themselves? Where do you get these done? or do you do them in house? We go with the VectorGuard Blue series. How about... "The [Spread] Eagle"? Too off-color? Do you have young children, by any chance? I second that- it would really cool to have PCB assembly too. How about... The Vertically Varying, Solder Paste Carrying, Lean Mean Precise Machine of Death? Those are a couple of awesome machines you guys have! Those are nice looking! I do have a question, I'm about to begin building 10-15 boards every two weeks (maybe three) but need a way to create stencils easily. How would you recommend making them for a small home-based fabrication? I've seen various methods and not sure what would be the best way to start off with. Any suggestions would be great! Hey...thanks! 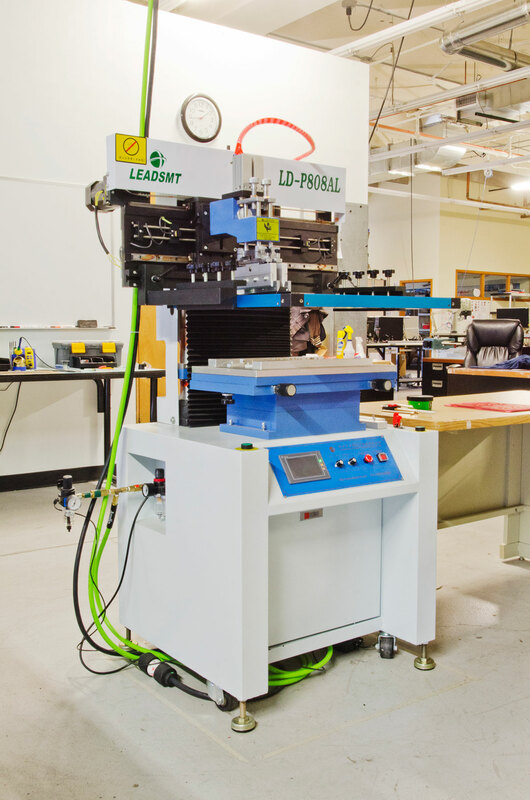 We're excited to be learning more and more about the amazing tools that are available for using in PCB assembly automation. Hey SparkFun, Parallax is in Rocklin CA not Sacramento. Rocklin is about 45 min drive (not during rush hour) from Sacramento. I have stopped by as well and talked to Nick Ernst (tech) about my Elev-8 build. I have stopped by many other times to pick up items I have ordered or attend their robotics fair held once a year at Parallax. If I traveled near Bolder CO more I would stop by SparkFun. Everyone at Parallax is great! You are right. Rocklin is the true home of Parallax. Please do come visit if you ever find yourself near Boulder! Which sounds like one of Mario's brothers. ... or whatever, I don't care. We have passed along our feedback to them, but the language barrier has been difficult to overcome. If we ever get a chance to visit Shenzhen again, we would love to visit this manufacturer to talk about design improvements in person. I've been thinking of making a small scale version of something like this. I was working on a parts list and just need to finish it up. Oops. Edited. I meant finish it, not fini ****. After looking at the new machine I started to wonder why you even need stencils. Why can't you have a CNC controller move a squirter head to directly print the solder paste onto the boards just like with a 3D printer? I suppose it wouldn't be fast enough for large volume needs, but wouldn't that work for hobby PC production? I don't know much about these processes, but as far as alignment, couldn't you just put a quarter inch hole in three corners of the stencil and PCB, then put some quarter inch pegs in the machine table? Assuming the drilling and traces are aligned on the PCB this should result in a perfect alignment every time. Or am I wrong? We've found that the inconsistencies in the PCB panel dimensions, from one panel to the next, make any sort of permanent or semi-permanent alignment fixture unusable. The cuts made by the PCB fabricator typically result in very slight dimensional differences between panels of the same design and even from the same fabrication run. I'm unsure that drilling out mount holes in the panels would result in any greater consistency that would not require at least some small adjustments of the stencil itself to ensure the apertures are lined up perfectly with the pads on the PCB. You'd think that the same house that makes the boards could make the stencils (from the same cad files) so they should drill the aligment holes in both. If all panels are the same size then all would have the holes in the exact same spots, which should line up with holes in the bed of the stencil machine. For a name, how about "Leadsmith". It's almost spelled out right there on the panel, it kind of describes what it does (modulo lead-free solder paste), and it sounds like a snarky name for a gunslinger. OK, so how many people did this new arrivial put out of work? OR did you just free some staff up to do other pressing tasks? As Bob said, nobody was displaced by this equipment addition. 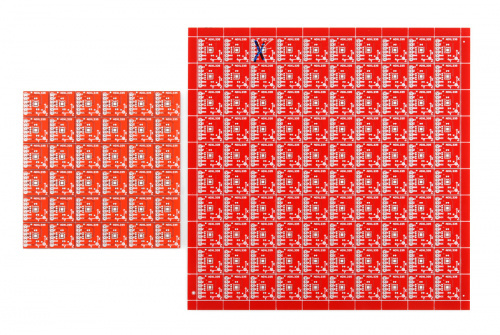 All signs point towards more PCB assembly production being needed in the coming years. :) So our equipment upgrades are only enabling us to continue to meet this increased demand with greater efficiency. This machine hasn't put anybody out of work. It has simply made the work easier for our pick and place operators. To be honest, with the addition of this machine, we have discussed the idea of our pick and place operators to become more general "equipment operators". Expanding their roles to include everything automated. Stenciling, PnP, Reflow, Washing, AOI, etc. So if anything, this new arrival has given our staff more work! Speaking of Washing, what is SF using to clean the flux off the boards and is that automated too? We introduced an Aqueous Technologies Trident CL (closed loop) washer into our equipment lineup a couple years ago. It has been a great batch washer for us. Before buying that washer, we had attempted to repurpose a used lab glassware washer but we never could quite dial in the results we were looking for. But, the new PnP machine has ensured the retirement of the "grab bag o' stuff our PnP dropped" product :( Maybe you can start a "random strips that are too small to start a new batch" grab bag category! When referring to a season, the word "fall" should not be capitalized. Right you are - fixed! Thanks. I left a note under 'General' by mistake regarding worker injury liability issues you need to be aware of. Please check it out. So if it produces more boards at a time, does this mean that there will be more dings and dents scrap boards? more board + less error = similar amount of spare boards? your last comment is correct, more boards with less error should result in about the same amount of ding and dent as the past. Typically errors that result in ding and dent boards are things like PCB manufacturer defects, unsuccessful rework attempts, etc. And the frequency of those issues shouldn't change to much with this new process. But will the spare boards eventually come back into stock along with the parts bag?